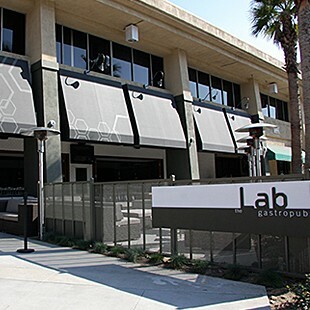 The science of fun and fine dining is artfully executed daily at The Lab Gastropub. Conveniently located on Figueroa Blvd., The Lab is next door to the Galen Center, across the street from USC and an easy walk to the Shrine Auditorium, the Los Angeles Coliseum and the museums at Expo Park. Our menu features a variety of pub favorites and an extensive selection of beers. The communal style seating encourages group fun. You’ll always find local sports as well as national events featured on the multiple screens throughout the restaurant. The Classroom, our private dining room, is ideal for social events and the outdoor patio is a great place to enjoy the SoCal sunshine. The Lab does not accept reservations.